This narrow lot home offers some of the extras usually reserved for wider lots, such as a wrap around porch and a two-car garage. A vaulted ceiling adds volume to the great room, while columns and a bay window add distinction to the dining room. The kitchen is designed for efficiency and offers access to the side porch and rear deck for outdoor dining options. 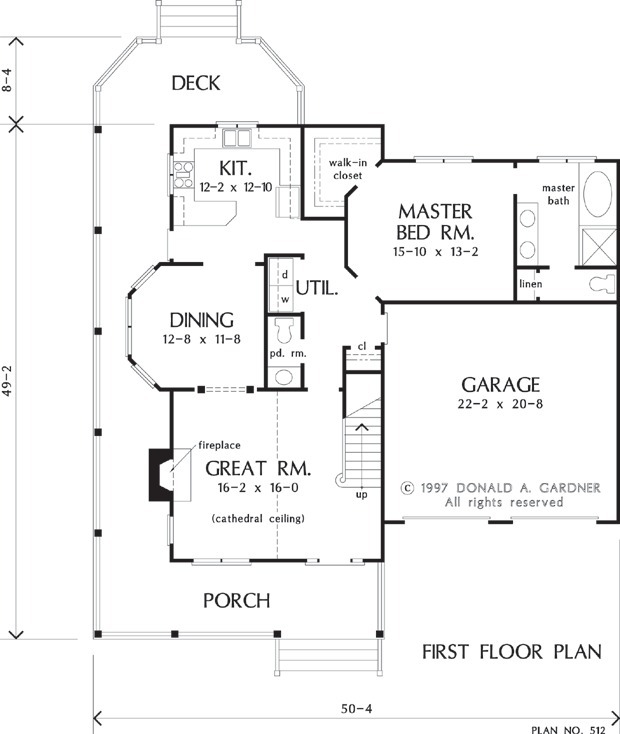 The master suite is located on the first floor, while two secondary bedrooms and a bonus room are upstairs. 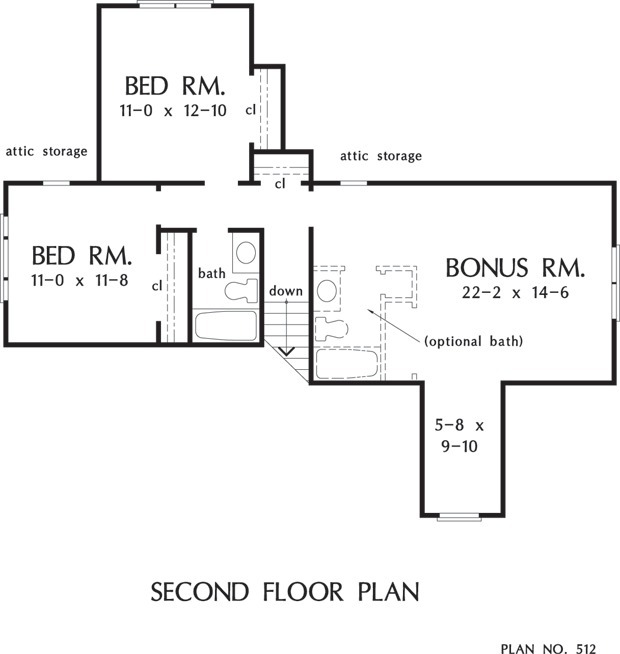 The bonus room can be turned into a fourth bedroom with bath for growing families. 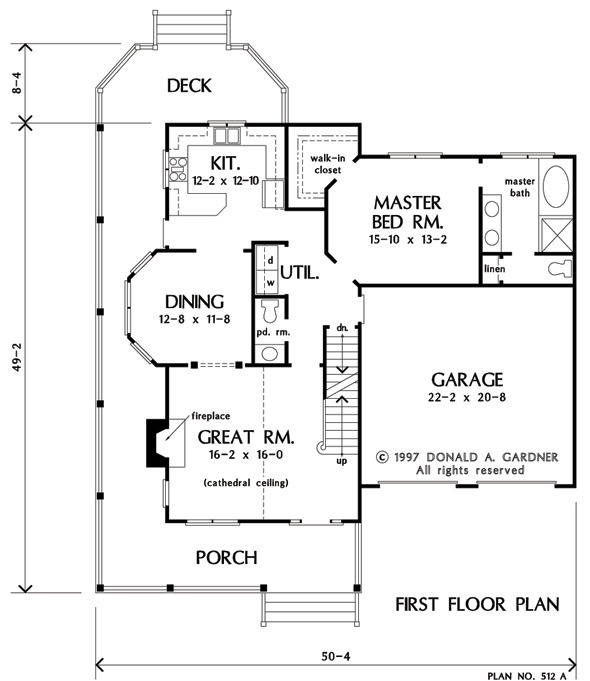 1st Floor: 1219 Sq. Ft.
2nd Floor: 450 Sq. Ft. Bonus Room: 406 Sq. Ft.
House Dimensions: 50' 4" x 49' 2"
Great Room: 16' 2" x 16' 0"
Master Bedroom: 15' 10" x 13' 2"
Dining Room : 12' 8" x 11' 8" x 9' 0"
Great Room (Cathedral): 16' 2" x 16' 0" x 20' 6"
Kitchen : 12' 2" x 12' 10" x 9' 0"
Utility Room : 3' 2" x 5' 4" x 9' 0"
Bonus Room : 22' 2" x 14' 6" x 8' 0"
Garage : 22' 2" x 20' 8" x 0' 0"
Master Bedroom : 15' 10" x 13' 2" x 9' 0"
Bedroom #2 : 11' 0" x 12' 10" x 8' 0"
Bedroom #3 : 11' 0" x 11' 8" x 8' 0"
Porch - Front : 27' 10" x 7' 4" x 0' 0"
Deck / Patio : 20' 2" x 8' 4" x 0' 0"